The ongoing French military intervention in Mali has not only saved the defenseless West African nation from almost certain complete occupation by marauding foreign terrorists and jihadists, it has also rekindled a debate on the risks and costs of Africa’s dependence on international charity for survival. With many developed countries facing both biting economic difficulties and growing donor fatigue of their electorates, and with African countries by and large still mired in destabilizing vulnerabilities, it is not premature to begin to ponder the consequences of another Mali-type crisis elsewhere in the region. Would France return or would someone else come to the rescue? Moreover, should any outside nation step in to prop up African states that many believe have no one to blame but themselves for their poverty, weakness and instability? Many Africans agree with former U.N. Secretary General Kofi Annan who says in his recently published memoir, “Interventions: A Life in War and Peace,” written with Nader Mousavizadeh, that internal African politics and leadership, not colonialism or other outside factors, are largely responsible for the continent’s malaise. He enjoins both Africans and non-Africans to “grow up” and focus on finding solutions that work — not on who provides them. At the same time, however, many Africans have had good reasons for coming to rely on foreigners for help. In recent years the “responsibility to protect” doctrine, which calls on outside forces to intervene when a nation’s civilians are threatened with slaughter, has gained currency, perhaps luring some African countries into a false expectation that should they become victims of nefarious forces, other members of the international community would swiftly respond with assistance. Meanwhile, globalization has made the world smaller, giving some Africans a false sense of security, a feeling that their global “neighbors” could always come to the rescue. In Mali’s case, a poor democratic country that devoted its meager resources to improving the quality of life of its people instead of building a large military establishment was the victim of a powerful terrorist invasion that brought Islamist fighters to within striking distance of the capital, Bamako, before French troops stopped the invaders. Yet Mali had been left to suffer alone for almost a year, an eye-opening experience at odds with the hype of a new and fairer international order of oneness promoted by advocates of globalization. In the end, Mali was lucky. The political stars aligned, and a new French president had his reasons for wanting to intervene. But not every African nation will be so fortunate next time. It is the fickle nature of the Mali saga that provides a lesson for the rest of the continent: Only self-reliance and preparation for the grim realities of an international order that is still riven by familiar divisions, inequalities and contradictions will save Africans. Even counting on the continent’s traditional multinational partners, including the African Union and the United Nations, can lead to deadly consequences in the event of a major crisis, as the former lacks the means and the latter must, before it acts, secure the backing of the Security Council permanent members, who may be guided by their own national interests and priorities. Ultimately, African countries bear primary responsibility both for the continent’s problems and for its eventual and, yes, inevitable renaissance. Other nations, in particular the major powers, can assist by refraining from sending mixed messages to the continent and instead assisting in cementing the emerging but still fragile momentum for reformist change that is gradually taking hold. To that end, the international community should consider facilitating adequate representation for Africa in the U.N. Security Council and helping the continent fight corruption, arguably the most corrosive factor that contributes to the region’s poverty, instability and dependence on charity. As African crises continue to dominate the work of the Security Council, the inclusion of an African permanent member would enable the continent to assume the driver’s seat in the quest for homegrown and internationally backed initiatives to prevent or resolve African conflicts. Since no single African country is as powerful or rich as the Council’s current permanent members, collective representation could be considered for Africa, perhaps through the granting of permanent membership to the African Union Commission. Such a bold and innovative step would help end Africa’s knee-jerk pattern of blaming outsiders for its problems and force it to step up and work with others to find sustainable solutions. To help increase Africa’s financial resources, the international community should assist African reformers by fighting transnational corruption and helping to return stolen funds to the African countries of origin. Since the lion’s share of the hundreds of billions of dollars illegally diverted from African treasuries by African elites is transferred abroad, the international community has a vital role to play. Africa needs a leak-proof plan that prevents the transfer of stolen funds from the continent into other nations abroad. No doubt there is growing recognition throughout Africa that predictable and lasting security can best be provided through internal good governance, good neighborly relations and national means. In the meantime, as Africans continue to face growing terrorist threats, the international community should send an unmistakable signal that the French intervention in Mali was not an exception but a precedent — and a warning to other groups of terrorists contemplating similar adventures in Mali or elsewhere on the continent. Sammy Kum Buo, a Cameroon national, was director for West, Central and North Africa in the U.N. Department of Political Affairs in New York from 2007 to 2012. In Mali, the French army is winning an exemplary war. It is saving a friendly country that was about to fall under the law of those who are expert in stoning and the amputation of hands. In so doing, it is smashing the connection they had begun to establish with their brothers-in-assassination in Nigeria and the rest of the region. It is successfully carrying out this exploit not with drones, but with men. It has sought contact, if not hand to hand combat, in the caves of the north of the country, involving its soldiers in difficult, high-risk operations which have already cost the lives of five of them. It is fighting far from its own bases, in unknown territory, in extreme climatic conditions, against an enemy trained to be tough, determined, fanatical, that moves elusively through the desert sand like a fish in water. This operation, efficiently carried out, one confronting a multitude of dangers, is all the war in Iraq was not. This lightning war, conducted and won with the support of Malian troops, without one sensing even the possibility of the threat of a quagmire, is the opposite of the war in Afghanistan. Better still, it is, come to think of it, the first defeat of military Islamism -- it had already been politically defeated in Libya, for the French intervention that revealed a fraternal face of the West had the effect of pulverizing the core of Al Qaeda's argument, the result of which, a year later, was the very natural defeat of the forces that called for Jihad at the ballot box. Well, here is a military defeat, one that demonstrates for the first time that Jihadism is no more capable of carrying out a war than it is of governing a state. This too is essential, and once again, this is a key date. Yet the extraordinary thing is that public opinion doesn't give a damn. The French are more passionately interested in the election of Miss France than they are in the heroic deeds of this new army of Africa. A nice Eurovision contest, if not just a Star Academy (a TV reality show), is more interesting than the destruction of, to use François Hollande's term, a potential Sahelistan. Worse still, the transfer of a British football player or a French World Cup victory elicits more fervor, more enthusiasm, more patriotic and national pride, than the soldiers of the Republic rendering the gangster bands of Abdelhamid Abou Zeid and Abdelkader Mokhtar Belmokhtar powerless to do any further harm. Or rather, yes, there were in fact signs of interest here and there, some stirrings of curiosity or emotion, a few brief, feverish reactions. But these were the echo of ridiculous objections --what's this war without any images? Why haven't more journalists been brought in to cover the operation, embedded, the way they do in America? Why doesn't your army have anything to say? Why are they hiding it all from us, and haven't we the right to the spectacle, in the age of the all-powerful visible, isn't that taken for granted, a right of man? Or else, in counterpoint, pathetic suspicions--is it really fitting for an ex-colonial power to come to the aid of a formerly colonized nation? What, about this story, is hidden in the shadows, what occult interests are they serving under the cover of great selflessness? Niger's uranium... oil, who knows where... control of subterranean sources of water... interests in Africa... money.... It was disgusting. And as for Europe, it was, if possible, even more appalling, because it experienced this war from the balcony, sullen, smugly sermonizing, using its support as a bargaining chip or flat-out refusing it, a vague training mission here, two transport planes there, lent to the Ecowas. You shouldn'ta done it without us, it's too easy to ask for help afterwards, when one never asked for permission in the first place. You were showing off? Going it alone? Singing and dancing, your war brand new and joyous? Well, time to pay up now! What a shame, what a disaster. And, for the true Europeans, those who, since Bosnia, are furious to see Europe without strategy nor courage, what a vow of impotence, what proof of non-existence. One perceives, in this situation, the sign of a persistent ignorance, extending to even the most enlightened, of the serious geopolitical stakes that decide our future and that, even when we forget them, never, unfortunately, forget us. Either that or the rapidly shrinking reduction of politics to roleplaying, no longer bothering with any precautions, completely lacking in grandeur; of History to a show deemed boring without injecting a few conspiracy theories here and there; and of the tragedy of our condition to this futile dramatization of which Kojève remarked that it is the pathetic caricature (and the subsequent advent, as in all post-historic eras, of a human animal devoted to bread and games, and to slavery). In both cases, it is disturbing -- and very sad. Bernard-Henri Lévy, French philosopher and writer. French aircraft pounded Islamist rebels in Mali for a second day on Saturday and neighboring West African states sped up their plans to deploy troops in an international campaign to prevent groups linked to al Qaeda expanding their power base. France, warning that the control of northern Mali by the militants posed a security threat to Europe, intervened dramatically on Friday as heavily armed Islamist fighters swept southwards towards Mali's capital Bamako. Under cover from French fighter planes and attack helicopters, Malian troops routed a rebel convoy and drove the Islamists out of the strategic central town of Konna, which they had seized on Thursday. A senior army officer in the capital Bamako said more than 100 rebel fighters had been killed. A French pilot died on Friday when rebels shot down his helicopter near the town of Mopti. Hours after opening one front against al Qaeda-linked Islamists, France mounted a commando raid to try to rescue a French hostage held by al Shabaab militants in Somalia, also allied to al Qaeda, but failed to prevent the hostage being killed. French President Francois Hollande made clear that France's aim in Mali was to support the West African troop deployment, which is also endorsed by the United Nations, the European Union and the United States. Western countries in particular fear that Islamists could use Mali as a base for attacks on the West and expand the influence of al Qaeda-linked militants based in Yemen, Somalia and North Africa. "We've already held back the progress of our adversaries and inflicted heavy losses on them," Hollande said. "Our mission is not over yet." A resident in the northern city of Gao, one the Islamists' strongholds, reported scores of rebel fighters were retreating northward in pickup trucks on Saturday. "The hospital here is overwhelmed with injured and dead," he said, asking not to be identified for fear of reprisals. In Konna, a shopkeeper reported seeing scores of dead Islamist fighters piled in the streets, as well as the bodies of dozens of uniformed soldiers. A senior official with Mali's presidency announced on state television that 11 Malian soldiers had been killed in the battle for Konna, with around 60 others injured. With Paris urging West African nations to send in their troops quickly, Ivory Coast President Alassane Ouattara, chairman of the regional bloc ECOWAS, kick-started a U.N.-mandated operation to deploy some 3,300 African soldiers. The mission had not been expected to start until September. "By Monday at the latest, the troops will be there or will have started to arrive," said Ali Coulibaly, Ivory Coast's African Integration Minister. "Things are accelerating ... The reconquest of the north has already begun." The multinational force is expected to be led by Nigerian Major-General Shehu Abdulkadir and draw heavily on troops from West Africa's most populous state. Burkina Faso, Niger and Senegal each announced they would send 500 soldiers. French army chief Edouard Guillaud said France had no plan to chase the Islamists into the north with land troops, and was waiting for ECOWAS forces. France has deployed some special forces units to the central town of Mopti and sent hundreds of soldiers to Bamako in "Operation Serval" - named after an African wildcat. Concerned about reprisals on French soil, Hollande announced he had instructed Prime Minister Jean-Marc Ayrault to tighten security in public buildings and on public transport in France. Hollande's intervention in Mali could endanger eight French nationals being held by Islamists in the Sahara. A spokesman for one of Mali's rebel groups, Ansar Dine, said there would be repercussions. "There are consequences, not only for French hostages, but also for all French citizens, wherever they find themselves in the Muslim world," Sanda Ould Boumama told Reuters. "The hostages are facing death." The French Defense Ministry said its failed bid on Friday night to rescue a French intelligence officer held hostage in Somalia since 2009 was unrelated to events in Mali. The ministry said it believed the officer had been killed by his captors along with at least one French commando. But the Harakat Al-Shabaab Al-Mujahideen insurgent group that was holding Denis Allex said he was alive and being held at a location far from the raid. The French Foreign Ministry stepped up its security alert on Mali and parts of neighboring Mauritania and Niger on Friday, extending its red alert - the highest level - to include Bamako. France advised its 6,000 citizens in Mali to leave. Thousands more French live across West Africa, particularly in Senegal and Ivory Coast. European Union foreign policy chief Catherine Ashton on Friday urged an "accelerated international engagement" and said the bloc would speed up plans to deploy 200 troops to train Malian forces. A U.S. official said the Pentagon was weighing options such as intelligence-sharing with France and logistics support. French officials suggest U.S. surveillance capacity, including unmanned drones, would prove valuable in vast northern Mali. Military analysts voiced doubt, however, about whether Friday's action was the start of a swift operation to retake northern Mali - a harsh, sparsely populated terrain the size of France - as neither equipment nor ground troops were ready. "We're not yet at the big intervention," said Mark Schroeder, of the risk and security consultancy Stratfor. More than two decades of peaceful elections had earned Mali a reputation as a bulwark of democracy - an image that unraveled in a matter of weeks after a military coup last March that paved the way for the Islamist rebellion. Interim President Dioncounda Traore, under pressure for bolder action from Mali's military, declared a state of emergency on Friday. Traore canceled a long-planned official trip to Paris on Wednesday because of the violence. 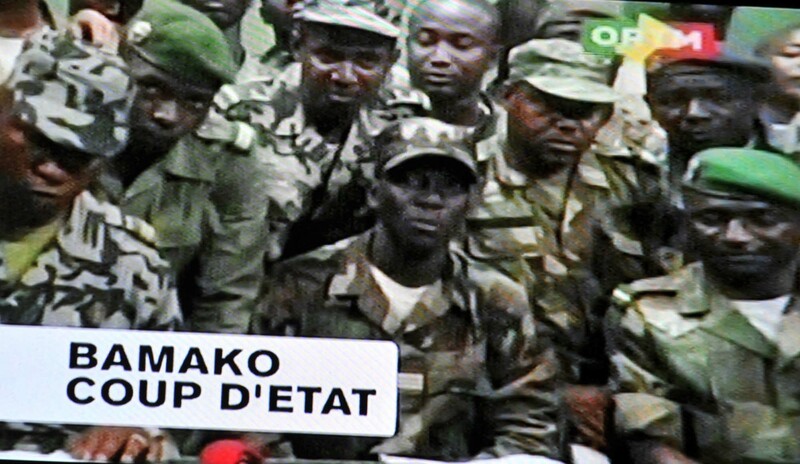 "Every Malian must henceforth consider themselves a soldier," he said on state TV. On the streets of Bamako, some cars were driving around with French flags draped from the windows to celebrate Paris's intervention. "It's thanks to France that Mali will emerge from this crisis," said student Mohamed Camera. "This war must end now." A mission from the International Monetary Fund (IMF), led by Christian Josz, visited Bamako from November 1 to 14 and reached preliminary agreement on providing support to Mali under the Rapid Credit Facility. “Mali’s economy is traversing a difficult period. Already under stress from the very poor 2011-12 harvest, it was severely affected by the March 2012 coup d’état and its aftermath. Substantial material damages were inflicted on both public and private sector parties. The occupation of the North seriously disrupted agricultural production and trade relations. The deteriorating security situation prompted a sharp reduction of travel to Mali. This hit hard the commerce, hotel and restaurant sectors. The donors’ decision to suspend all budget support and much of their project aid to the government led to a contraction of the construction and public works sector. But mining proved a stable source of growth, and the 2012-13 harvest is turning out well. “Real GDP in 2012 is forecast to shrink by 1.5 percent, following only 2.7 percent growth in 2011. The poor harvest in 2011 and trade disruptions pushed average inflation in 2012 to an estimated 5.9 percent. The government managed its budget prudently by offsetting the loss of revenue by cutting expenditures, especially public investment, and reducing implicit subsidies on petroleum products and cooking gas. As a result, the basic budget deficit (revenue and budget grants minus domestically financed expenditure) is expected to be 1 percent of GDP in 2012. “In 2013, real GDP is forecast to grow again, at 4-5 percent. The 2013 budget exhibits a financing gap of some CFAF 55 billion ($110 million or 1 percent of GDP) which the authorities hope to fill with renewed donor support. Until this support is confirmed, they will freeze an equivalent amount of spending. The authorities are committed to avoiding the accumulation of domestic arrears, in order to maintain the government’s credibility and preserve financial stability. The International Monetary Fund said on Wednesday that it had reached an $18 million loan agreement with Mali. The loan to the land-locked African country comes under the IMF's Rapid Credit Facility, a quick-disbursing fund for poor countries recovering from natural disasters or conflict. Mali descended into chaos after a military coup in March. The agreement is subject to approval by the IMF's board early next year. Mali received a $46 million loan from the IMF last year but cancelled it after soldiers toppled the president and al Qaeda-linked militants seized northern cities. A leading producer of gold and cotton, Mali faces a budget shortfall in 2012, especially since the European Union and the United States suspended aid after the coup. "Mali's economy is traversing a difficult period," Christian Josz, head of the IMF's mission, said in a statement. "Already under stress from the very poor 2011-12 harvest, it was severely affected by the March 2012 coup d'état and its aftermath." The IMF said national income should shrink 1.5 percent in 2012 before rebounding to 4 percent or 5 percent in 2013. The Fund said that the government did well to cut public investment and reduce subsidies on oil and cooking gas, resulting in a "modest" budget deficit. For 2013, Mali faces a budget shortfall of $110 million, but it will freeze spending unless it is able to plug the gap with development aid from donors, the IMF said. "You've probably never heard of him, but Mansa Musa is the richest person ever. The 14th century emperor from West Africa was worth a staggering $400 billion, after adjusting for inflation, as calculated by Celebrity Net Worth. To put that number into perspective -- if that's even possible -- Net Worth's calculations mean Musa's fortune far outstrips that of the current world's richest man Carlos Slim Helu and family. Malian soldiers Sunday repelled a fresh attack by Tuareg rebels in the north following a coup as the junta struggled to restore order after ousting the west African nation's president. The Tuareg had said they were advancing on the key northern town of Kidal, but a military official in the town told AFP the rebels had been pushed back. "Today we repelled an attack by Islamist rebels," a military official in Kidal told AFP on condition of anonymity, referring to one of two rebel movements fighting for independence of the traditional homeland of the desert nomads. The desert tribes in January launched their first rebellion since 2009 in a decades-old demand for independence, boosted by the return of heavily-armed battle-hardened fighters from Libya who served late dictator Moamer Kadhafi. Their forces overwhelmed the weak Malian army, and scores of soldiers are said to have been killed and captured, causing anger among troops over the way the conflict is being handled by the government. Angry soldiers revolted in Bamako Wednesday, leading to a full-blown coup early Thursday as they seized government buildings and forced the president to flee. Junta leader Captain Amadou Sanogo has invited the rebels to hold talks and begin a "peace process" as he tries to restore order. Bamako was tense on Sunday with few people venturing out as security forces patrolled the streets. Banks and most shops were shut in the usually bustling city, although some petrol stations have reopened after being asked to do so by the junta. President Amadou Toumani Toure's whereabouts are unknown, but he is believed to be safe under the protection of his loyalist paratrooper guard, while 14 members of his government detained by the putschists have threatened a hunger strike. "There are 14 of us in a room of 12 square metres, sleeping three to a mattress. Our basic rights are being violated," said a message from one of the officials sent to AFP. They are being held at the Kati military barracks outside Bamako where Sanogo is seeking to reinforce the impression of control, holding meetings and making several public declarations. He met French ambassador Christian Rouyer and other dignitaries on Saturday, state television reported, but the junta has been largely frozen out by the international community in a chorus of rebukes and suspension of aid. On Sunday, Nairobi announced that the Kenyan and Zimbabwean foreign ministers were evacuated by a chartered flight after being stranded in Mali following the coup. After widespread looting by soldiers in the coup aftermath, the junta urged "all those in uniform to report to their barracks for an inspection" and reminded unit commanders they were responsible for their men. On Saturday Sanogo took to the television to show he was still alive and douse rumours of a counter-attack by loyalist troops. The Tuareg rebels said in the wake of the coup they would continue their offensive, and The Islamist rebel group Ansar Dine, or Defenders of Faith in Arabic, said Saturday its fighters had surrounded Kidal. "Thanks to Allah the almighty and his blessings, we will soon take our land in Kidal," said a statement from the group. While Ansar Dine is demanding the imposition of Islamic law, the other rebel group, the Azawad National Liberation Movement (MNLA) has distanced itself from religious objectives. Mali will on Monday will mark the 21st anniversary of the last coup, when Toure led the overthrow of dictator Moussa Traore and steered the country to its first democratic election a year later for which he is considered a hero. After Mali's democratic advances in the past two decades, Thursday's coup alarmed the international community which reacted with swift condemnation. The African Union temporarily suspended Mali, while Europe and Canada froze aid and the United States has threatened to follow suit. A joint mission from the African Union and Economic Community of West African States met representatives of the junta on Friday, according to Mali state television, without giving further details. ECOWAS heads of state will hold an emergency meeting in Abidjan on Tuesday, the day the junta has called for civil servants to return to work.